All this week, all over the world, you have a chance to own a free, original painting from some one of your favorite movies of all time. In 19 cities across five different countries, artist Scott Campbell is kicking off what he calls The Great, Great Showdowns Hunt. Campbell is celebrating the release of his third book, Great Showdowns: The Revenge, and to do so he’s hiding original paintings of famous movies in the place those movies were shot. Above, you see two of the first four, but you can see them all below. The series started at Los Angeles art gallery Gallery 1988 in 2007 and has exploded since—into a dedicated website, two full gallery shows and three hardcover books, including the new one. Which brings us to The Great, Great Showdowns Hunt. Since he almost exclusively shows his work in New York and LA, Campbell thought the idea of a global scavenger hunt would be just the thing to please fans he doesn’t often get to interact with. Here’s how it works: Below, you are going to find the first four paintings along with a little write up by Campbell himself. These paintings are right now, as you read this, hidden at the location the scene takes place. Then, each day through November 8, Campbell will hide four more. So check out the paintings, read Campbell’s clues below, then run out and find them. And don’t forget, these can be anywhere in the world. UPDATE 2:45pm Nov. 2: All four showdowns have been found and accounted for. Call off today’s search. This painting is of four rather violent fellows. The film follows their violent exploits as they needlessly terrorize the people around town. In this particular scene, the fellows are walking along a little lake in slow motion. One of the fellows decides he wants to get violent with his bros and a slow motion fight ensues in and around this water. Where were they horsing around in slow motion? This is a very action-packed movie that follows the exploits of a boy who must battle all of his new girlfriend’s ex-boyfriends. They all seem quite super-powered, so this task feels a bit overwhelming. In this particular scene, the boy comes in contact with the famous movie star ex-boyfriend and challenges him to an epic skateboard rail slide down a very long stairway. Where was this rail slide attempted? That’s four. There will be 21 more coming though Sunday, and those will all be revealed on Slashfilm.com and Campbell’s site, GreatShowdowns.com. 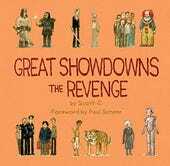 If you find one, Tweet @ScottLava with the hashtag #GreatGreatShowdownsHunt to brag to the world.